Model Town has lately seen the evolving of a couple of lounges and bars. After Jail , Madaari is the new hype in Model town or rather North Delhi. I used to pass this place in Model Town 3 whenever heading towards the second stop market and wonder how the food would be here. At that time, the lounge wasn't launched, now that it is in action i finally visited the place for a dinner on a Sunday. Tha ambiance is really one of its kind. Something you won't find in North Delhi. The lightings were appropriately dim. The sitting is very comfortable but the music was too loud giving it a club feel. In drinks, i had Blue Lagoon and chocolate oreo Shake. Both were good specially the shake. Usually thick shakes taste good but here the shake was light and still tasted great. Next i had veg manchow. This didn't disappoint me either though there are a lot better places serving soup in Model Town. 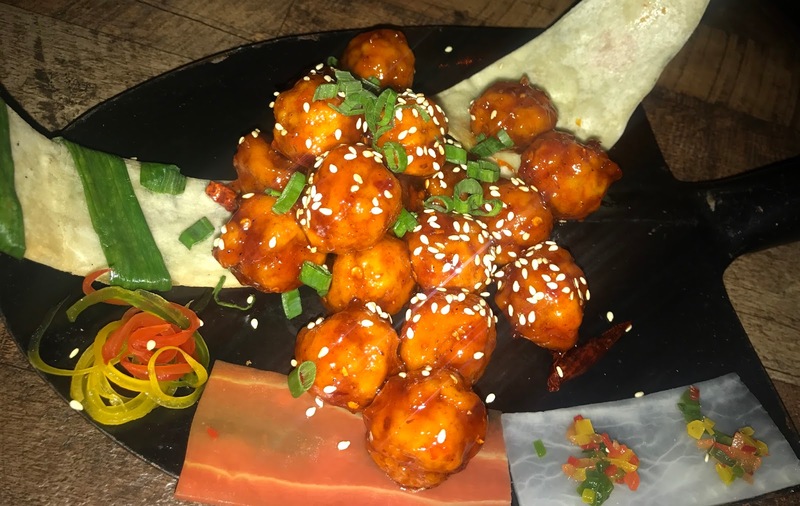 In starters, i tried Manchurian , Honey chilli potato , Crunchy paneer Tikka and Cheese stuff Mushrooms. I am not a paneer lover and neither did i like it here. The chilli potato and mushroom were really good. Manchurian were a little on the average side. In main Course, i had Dal Makhni and Butter Chicken accompanied with breads. Both were delectable. The chicken was well cooked and perfect in taste. All the best to this new place.